This book concentrates on the latest developments in our understanding of solid-state device physics. The material presented is mainly experimental and based on CdTe thin-film solar cells. It extends these new findings to CIGS thin-film solar cells and presents a new device design based on graded bandgap multilayer solar cells. This design has been experimentally tested using the well-researched GaAs/AlGaAs system and initial devices have shown impressive device parameters. These devices are capable of absorbing all radiation (UV, visible, and infra-red) within the solar spectrum and combines "impact ionization" and "impurity photovoltaic" effects. 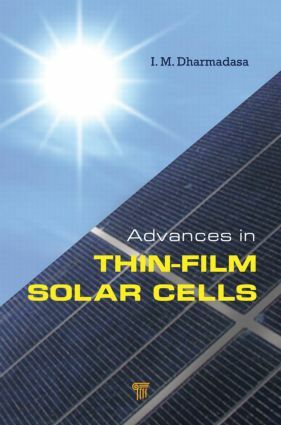 The improved device understanding presented in this book should impact and guide future device design and low-cost thin-film solar panel manufacture. Is Fermi-Level Pinning Affecting GaAs-Based Solar Cells? I. M. Dharmadasa has worked in semiconductor research since becoming a Ph.D. student at Durham University in 1977. His interest in the electrodeposition of thin-film solar cells began when he joined the Appolo Project at BP Solar in 1988. He continued this area of research on joining Sheffield Hallam University in 1990. He has 80 refereed papers, six patents and over 100 conference presentations, and five book contributions, and he has successfully supervised 10 research degree candidates and nine years of PDRA support. He has gained research council and internal University funding and is currently working with a group of industrial partners (Ionotec Ltd, Pilkington plc, and ICP Solar UK) to commercialize the new research findings with the UK Government’s DTI-funding.